This post belongs to a special series of posts written by students in Dr. Simon Engelhart’s Coastal Geologic Hazards course at the University of Rhode Island. 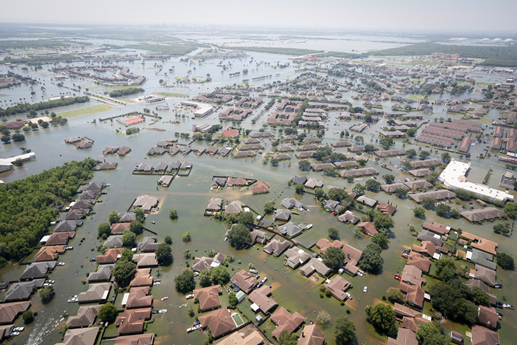 In this course students learn about coastal processes, including storm surges and sea level rise, and how these impact people and the environment. Seeing sea level rise projections on their own can be frightening. However, those projections alone do not tell the full story. Due to various geologic processes that occur on local levels, global sea level projections won’t have the same impact everywhere. Some areas will have sea levels rise at a greater amount than projected, while other locations may see less. This phenomenon is known as relative sea level rise. What’s scarier than sea level rise? How about sea level rise coupled with sinking coastlines? This sinking, often known as land subsidence, is a real threat to many coastal areas. Coastlines are dynamic landscapes, with continuous changes in land area and elevation. Influence from land level rise, glacial melt, wind, sand deposits, and erosion (just to name a few), can significantly alter the elevation of sea level without the ocean ever changing volume. The effects of sea level rise can be amplified by coastal subsidence. Understanding the causes of coastal subsidence can help us make predictions of where subsidence is happening and how it will shape the future of our coastlines. Land subsidence is thousands to tens of thousands of years in the making. During the last glacial period, the New England coast was covered by the Laurentide Ice Sheet. Even though these glaciers retreated over 11,000 years ago, land depression caused by ice weight are still reacting to these changes! The shifting of earth in response to ice formation and ice melt is known as glacial isostatic adjustment (GIA). GIA is a major driver of land subsidence for much of New England. According to researchers like Dr. Makan Karegar of the University of Bonn, parts of the east coast are seeing as much as 1.22 mm of subsidence due to GIA every year (Karegar et al., 2017). Another long-term process that results in subsidence is compaction. Compaction is the compression of sediments. One way to think of compaction is to think of a steamroller as it drives over pavement. We use steam rollers to apply mass and pressure on new pavement for smoothing. A steam roller will force pavement layers to press together, removing empty pore space and leveling out the surface. Sediment compaction works in a similar way. Natural sediments contain a lot of pore space and organic debris like roots and plants. As new sediment continues the accumulate, the sediment below starts compressing due to the overlying weight. This compaction will force empty spaces and organic matter to compress, ultimately shrinking the amount of space it takes up. How quickly compaction happens is influenced by what the deposit is made out of and how much material there is above the deposit. For example, organic rich depositional layers such as peat will undergo rapid compaction. In addition, the more material above the sediment layer, known as overburden thickness, the faster the compaction rate will be. Compaction is a natural process that happens to most sediment profiles over time. Certain parts of the United States are very prone to compaction due to their organic-rich environments. This is a major problem for coastal communities with histories of large coastal salt marshes, such as New Orleans and the greater Mississippi Delta. While the extensive marsh system here may help defend the coast from storm surge, its composition leaves it susceptible to compaction, exacerbating problems due to sea level rise. Sea level rise is often a topic of discussion for New Orleans communities, especially in ones that have been hard-hit by catastrophic storms. Research from Dr. Torbjorn Tornqvist at Tulane University uncovered that rates of compaction in parts of the Mississippi Delta may be as high as 10 mm per year (Tornqvist et al., 2008). Subsidence in Mendota, California due to compaction of excessive ground-water extraction in 1977. Photo courtesy of USGS. It is important to note that subsidence can also be influenced by human activity. Fluids including groundwater and oil naturally occur in porous media, such as sandstone and loose sediment. Humans have developed technology to pump fluids out from underground for a variety of reasons, including obtaining drinking water and energy resources. However, fluid extraction causes a decrease in sediment volume and pressure. This causes the suddenly-empty pore spaces to collapse, which can increase the rate of compaction (Figure 2). This has been shown to hold true for oil production (more oil production means more oil being pumped from the ground) and water withdrawal from aquifers. We see this phenomenon in coastlines of the northern Gulf of Mexico, where oil drilling and aquifer pumping have increased rates of land subsidence (Kolker et al., 2011). Dr. Kolker of the Louisiana Marine Consortium was able to link oil production rates in south Louisiana to subsidence rates for Grand Isle, Louisiana. He also successfully linked water withdrawal rates and subsidence rates in Galveston, Texas. Understanding the causes of land subsidence will play a critical role in coastal management moving forward. As with many aspects of land management, there are limited funds for a variety of needs and potential projects. Knowing which local processes are at play can help guide coastal managers in making decisions about where that money is best spent. Recent attempts to combat the effects of sea level rise include adding sediments to coastlines in hopes of artificially raising coastal elevation. Adding sedimentary material to a section of coastline to raise may sound logical, but if it is an area that is influenced by compaction, that decision may actually worsen subsidence. It will increase the overburden thickness, which will in turn increase the rate of compaction. Coastal management in the face of sea-level rise is a tricky problem with multiple complications, and there are no easy answers. But the strongest defense against the effects of sea level rise starts with understanding all of the contributing factors. Michaela Cashman is an ORISE fellowship participant at the US EPA Atlantic Ecology Division in Narragansett, Rhode Island. She is concurrently working on a Ph.D. in microplastic detection and isolation in marine sediments. Michaela is interested in emerging contaminants, microplastics, remediation technologies, and hydrogeology. Her free time is spent constructing stained glass windows and advocating for her graduate student union, URI GAU. Casey Dannhauser is currently working towards a Masters of Oceanography at the University of Rhode Island. When she isn’t focusing on her schoolwork, she can be found working to improve the coastal water quality in Cotuit, Massachusetts, for the Barnstable Clean Water Coalition. Feature image: Flooding in Port Arthur, TX after Hurricane Harvey. Photo courtesy of Staff Sgt. Daniel J. Martinez. ← Can your pet’s pest control product harm you? Are Harmful Algal Blooms a New Concern For Coral Reefs?